This piece grew out of a class at the last National Academy of Needlearts Assembly by Kay Stanis. We had been instructed to bring pictures of fire and fibers which made us think of fire. During the class, we were given Tyvek, wool roving, and red and yellow acrylic paint with which to color the fibers. I had also brought Angelina fiber, colored roving and doilies. The class was spent creating the raw materials. The doilies reminded me of the glowing ends of campfire logs. The Tyvek and roving form the base but stitching gives it its life. The fascinating thing about fire is the changing shapes and colors. The challenge is to convey in two dimensions the movement and inner life of a fire. 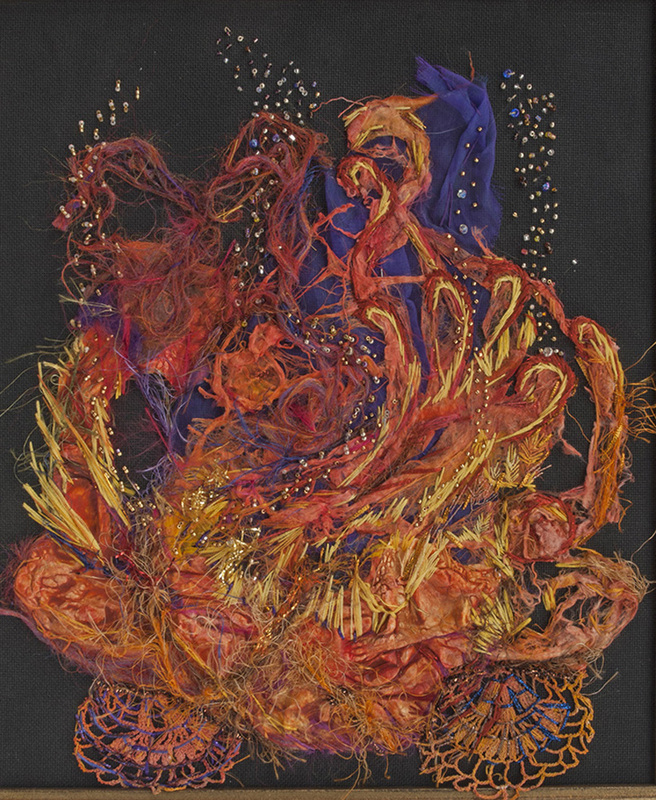 The darker roving gives it dimension while beads and metallics allow it to have the movement and life of a real fire.